Five Cocktails for a party! I love cocktail parties. Especially ones that give me the opportunity to take my guest’s palates to another level. This little cocktail party served notice that great mixed drinks don’t have Fireball or Tito’s in them. Far from. They take great parts and incredible craft spirits and bring these liquid driven adventures truly to a higher place. I was given a bottle of Martinique Blue Cane Rhum Agricole recently and I couldn’t think of a nicer way to serve it than with Royal Rose- Simple Syrup of Cardamom and Clove and a bit of seltzer water. The second cocktail took a simple drink known as the gin and tonic and quite literally, raised the bar with thirty different types of gin. The crowd favorite? A little gin in a gorgeous bottle from Scotland named Caorunn. For some reason (well known to those of us who love artisanal gin) the Caorunn has a richer texture and ‘ginny’ character that worked so well with the multitude of tonic waters that I brought with me. Amongst the gins were The Botanist, SW4, No.3., Martin Miller’s Pot Still, Hat Trick, FEW, Nolet, Beefeater, and many others. I’m sure that the third drink is where you want to get going- and that would mean immediately! The Soda and Cocktail Syrup named Fruitations is where this drink really takes off. 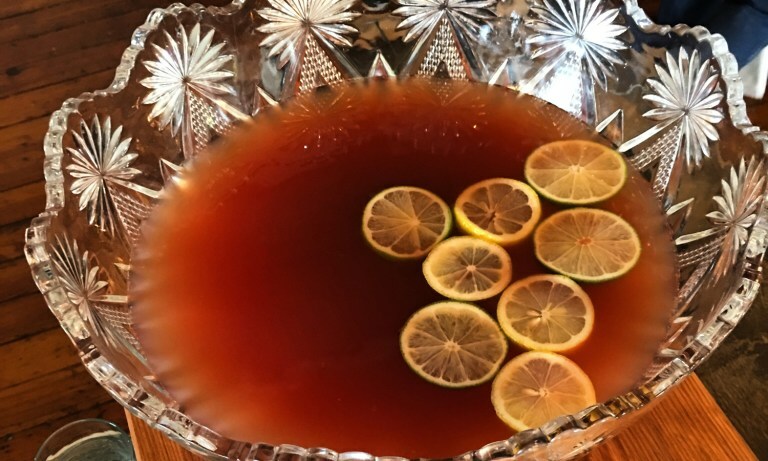 I used the brilliant Tangerine syrup and combined it with Mezcal and then finished it off with a Cane Sugar Ginger Beer from Australia named Bundaberg. Brilliant stuff. A wedge of fresh lime and lemon bitters sent this drink further than it has ever been prior. Trust me. The next drink was my own take on the classic Old Fashioned, and it departs from the classic in one very determined way. I chose to roast several different kinds of oranges in a bath of both Balsamic vinegar and Demerara sugar until caramelized and bubby- about 2.5 hours at 350 degrees covered. The final ½ hour is uncovered to add a bit of darkness to the softly cooked fruits. I then roasted some Luxardo cherries until warmed through and quite soft- about 30 minutes at 350 degrees. Set to cool so you won’t break your expensive crystal with sizzling hot fruit, pricy whiskey and ice! The final drink was the easiest to duplicate because once you are able to buy a good quality Absinthe, you’ll be more than ½ way there. Any of the fine Absinthes made by Jade would work beautifully, as would the Lucid line. There is one thing that I must stress. The lack of color is far preferable to the ones with color added. It’s just my preference. Next PostNext Fathers DecarbDay Gift!